Who Benefits from the Death of the French Oil Giant Total’s CEO Christophe de Margerie? October 21, 2014. Tragic news: The private transcontinental jet carrying Christophe de Margerie, CEO of the French oil and gas giant Total, crashed in Moscow Vnukovo-3 Airport. Vnukovo-3 isn’t your average overcrowded commercial outfit; it is an airport designed to receive the international VIPs and their private jets. The jet in question is Falcon 50, French made, cost $170-200 million. According to experts, it is one of the most reliable jets in existence, and it is designed for long-distance flights. Such a jet carrying a VIP such as Total’s CEO would be kept in excellent condition and the pilots would be top-notch. The crew on such jet is usually paid much more than commercial pilots. What happened based on early reports: Moscow had a heavy snow aggravated by fog. Snow clearing ploughs were operating. The jet’s wing on take-off clipped the snow plough operating nearby, but the plane took off nevertheless. The driver of the plough was unharmed, but the Russian investigators announced that he was drunk. After 40 seconds in the air, the pilot sent distress call and attempted to land, but the plane burst in flames, killing all four aboard: three crew members and one passenger, Total CEO Christophe de Margerie. Here is a report about the main investigative points on RT Russia. The questions investigators ask are: how could a drunk person be allowed to operate a snow plough? How could a dispatcher authorise a take-off with a plough present? What role did the snow and heavy fog play in all this? Did the pilot make a mistake? Did he, for example, drive off his course in the fog, resulting in the collision with the plough? If I were them, I would also ask these questions: 1. Who and why gave the order to the snow plough operator to clean up the snow in the take-off area at that specific time? If the take-off area needed to be prepped first due to snow, then perhaps it was the correct order. Then, the Total jet needed to wait until the area was cleared of snow. Perhaps it was a lack of coordination between maintenance, dispatch, and the pilot? Did the pilot get pressured by the VIP to take off immediately, despite bad weather? Also, I looked at the video with the plough operator and he seemed very shocked and distressed. One thing he didn’t seem at all was being drunk. Sure, the shock could have sobered him up, but I still have serious doubts he could have been that drunk. Summary of the event video, including the plough driver. It appears Russian authorities decided to admit their fault even before the investigation and assign the blame internally due to the delicate political situation and in order to keep peace. But let’s take a look at what went on behind the scenes geopolitically in the run-up to the event. What was the Total CEO doing in Moscow? Total’s CEO Christophe de Margerie took a different position on world events, USA, and Russia than the prevailing neo-liberal position of his government. He was against USA interference and dictate in European affairs, and for the expanded cooperation with Russia. Total is the French oil and gas giant, ranking #6 in the world. As a result of the US sanctions, primarily the ban on dollar-denominated loans to companies operating in Russia, American oil giant Exxon Mobil was recently forced to fold its joint operations in Russia’s north. This is a big hit for Exxon’s bottom line. The company announced that they didn’t want to leave and planned to return as soon as the sanctions were over. At the very same time, Total, which took a position of defiance against the US and EU sanctions, re-affirmed its participation in Russian projects. Moreover, Total was negotiating stepping in and replacing Exxon and other Anglo-American companies in the $27 billion Yamal liquefied natural gas project, and possibly, in the Arctic oil project as well. To accomplish that, Total was planning on using a combined euro, ruble and yuan financing. Total was in the process of securing a Chinese financing to replace the American loans. At the bottom of this article you will find a telling quote from a NASDAQ article of 9/22/2014 about Total’s negotiations with the Chinese banks. Total CEO was in Moscow to discuss and negotiate the expanded deal. He was scheduled to fly back to Paris at 12:10 am, after the meeting with Russian PM, Dmitry Medvedev. Total management appears to indicate that nothing will change in Total’s position and plans in regards to Russia as these are long-term plans that get drawn for 20-40 years forward. However, having taken a bold bet on the expanded cooperation with Russia, Total’s CEO didn’t get the chance to groom a successor. “He planned to, but never got around to it.” This leads some experts to believe that now that Total’s CEO Christophe de Margerie is gone, the US will apply enormous pressure on the company to change its course towards Russia. The above leads some to suspect a foul play in the death of Total’s CEO. Whether his death was the result of a tragic coincidence, poor coordination or bad weather, or whether a more sinister scenario was at play, the geopolitical circumstances paint a very different picture of the event than seems on the surface. If we also take into account the other events: strange disappearance of the Malaysia Airlines flight over the Indian Ocean early this year and the recent MH17 false flag downing in Ukraine, the picture becomes even more tainted. We should also remember the strange recent failures of the Russian Proton-M cargo rockets. Strangely, all the failures of Russian rockets occurred when they were carrying foreign satellites . These rockets use American made electronics. Incidentally, a new Proton-M rocket was just launched from the Baikonur in Kazakhstan without a hitch: the blast-off video. I could have predicted that there would be no problem with this launch because it was carrying a domestic Russian satellite. It should be clear that the reason only foreign satellite launches of Russian rockets fail is because someone is trying to discredit Russia as a reliable business partner. Before these mysterious recent failures, Russian space industry had no failures for over 40 years. I wrote about this problem in my prior articles, where I pointed out that in my opinion the reason behind failures was the Trojan software that could be activated or de-activated when necessary. Read more: Damning Eye-Witness Video of MH17 False Flag; Plus, Strange Failures of Russian Rockets. Add to that the fact that since General De Gaulle, France has been one of the most pro-Russian countries in the EU, plus the fact that historically, France was more willing to do business with Russia than many other Western countries, often serving as a bridge between the West and Russia. France is supposed to deliver two Mistral carriers to Russia and if it doesn’t, it will be a huge loss for the French economy. Presently, US is putting enormous pressure on France not to deliver the Mistrals, which would result in a broken contract and huge penalties. France’s BNP Paribas earlier this year already fell victim to the US sanctions, having to pay a $10 billion penalty, essentially bankrupting the bank. Various representatives of the French government and industry have been registering timid protests against EU’s US dollar dependence and US interference in the EU affairs. 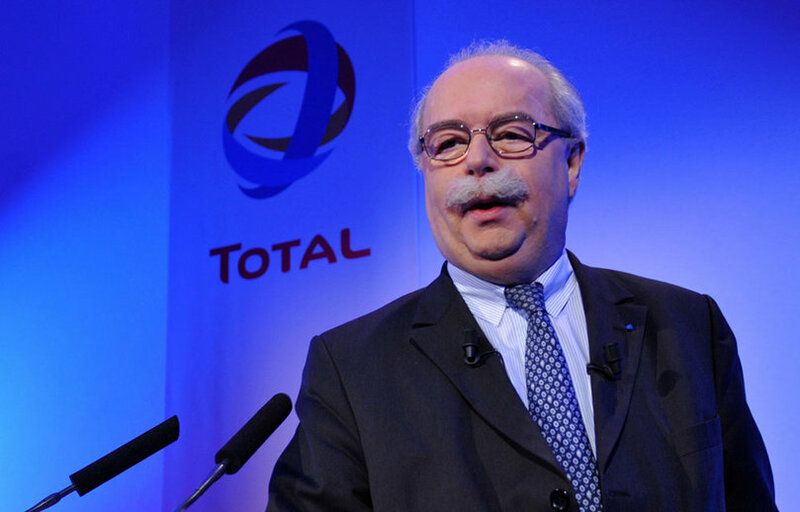 CEO of Total was a very influential voice in France for cooperation with Russia. What does all the above have to do with the Total CEO jet crash in Moscow? Perhaps nothing, perhaps everything. Time will show. One thing is very clear: the death of Total’s CEO Christophe de Margerie was against the interests of Russia, France, or Total itself. One of the easy ways to damage a plane is sabotage. Who and why told the worker to snow-plough the take-off area at that time? Incidentally, the snow plough’s operator name is Vladimir Martinenko, a typical Ukrainian name. Is he from Ukraine, and what part thereof? How does he feel about what’s happening there? Where do his loyalties lie? Could he be bought, or convinced to do something illegal? These are all very good questions. He did survive the accident without a scratch, despite the plane’s wing getting so damaged by his plough that the jet burst into flames 40 seconds after takeoff. Does the plough operator’s name and origin have anything to do with the event? There are lots of Ukrainian citizens working in Russia, most in maintenance, cleaning, construction, driving and other blue-collar positions. Most Ukrainians are pro-Russian, but there are no guarantees. This may mean absolutely nothing, or it may mean everything. If I were investigating this occurrence, I would look into that. Vladimir Markin, Head of the Central Investigative Commission of the Russian Federation, called the work of the airport authorities “sloppy,” and revealed the steps the investigation is taking. The snow plough driver has been arrested and the airport management may be temporarily suspended to prevent them from influencing the investigation. Interview. By Selina Williams. Published on nasqaq.com, 9/22/14 – Link to post. “French oil major Total S.A. on Monday said it was in talks with Chinese banks to help fund a major natural-gas project in Russia in a move to get around tightening Western sanctions over Ukraine. Chief Financial Officer Patrick de la Chevardière said the company was looking at financing its share in the $ 27 billion Yamal liquefied natural-gas project in Chinese yuan, Russian rubles and euros. “The effect of U.S. sanctions was that Yamal LNG will be prevented from raising any dollar financing,” Mr. de la Chevardière told a news briefing in London. Total is developing the onshore Yamal project in Russia’s Arctic north with independent Russian gas producer OAO Novatek and China’s CNPC. Total would first look for financing for Yamal from export credit agencies such as France’sCoface and Italy’s Sace and then add Chinese and Russian finance, Mr. de la Chevardière said. Total’s move comes as U.S. oil giant Exxon Mobil Corp. said last week is it winding down its drilling campaign in the Russian Arctic because of sanctions announced by the U.S. and European Union this month. The setback to Exxon’s $3.2 billion deal to explore for oil with Russia’s Rosneft in the Arctic could represent the biggest corporate casualty of sanctions so far. Earlier this month, Russian officials said that restrictions on western technology for drilling in hard-to-reach areas such as the Arctic Sea could hurt future oil production if they persist. Russia relies on oil and gas to provide the bulk of its revenues and Yamal is vital to Kremlin plans to increase the country’s share in the fast-growing global LNG market.